The PHPUnit Bridge provides utilities to report legacy tests and usage of deprecated code and a helper for time-sensitive tests. Provides a ClockMock and DnsMock helper classes for time or network-sensitive tests. Provides a modified version of PHPUnit that does not embed symfony/yaml nor prophecy to prevent any conflicts with these dependencies. Use the official Git repository (https://github.com/symfony/phpunit-bridge). Reports deprecation notices that were triggered without the recommended @-silencing operator. Deprecation notices denote tests that explicitly test some legacy features. Deprecation notices are all other (non-legacy) notices, grouped by message, test class and method. Without the @-silencing operator, users would need to opt-out from deprecation notices. Silencing by default swaps this behavior and allows users to opt-in when they are ready to cope with them (by adding a custom error handler like the one provided by this bridge). When not silenced, deprecation notices will appear in the Unsilenced section of the deprecation report. Make its data provider start with provideLegacy*() or getLegacy*(). PHPUnit will stop your test suite once a deprecation notice is triggered whose message contains the "foobar" string. By default, any non-legacy-tagged or any non-@-silenced deprecation notices will make tests fail. Alternatively, setting SYMFONY_DEPRECATIONS_HELPER to an arbitrary value (ex: 320) will make the tests fails only if a higher number of deprecation notices is reached (0 is the default value). You can also set the value "weak" which will make the bridge ignore any deprecation notices. This is useful to projects that must use deprecated interfaces for backward compatibility reasons. New in version 3.1: The ability to disable the deprecation helper was introduced in the 3.1 version of this component. Set the SYMFONY_DEPRECATIONS_HELPER environment variable to disabled to completely disable the deprecation helper. This is useful to make use of the rest of features provided by this component without getting errors or messages related to deprecations. * @expectedDeprecation This "%s" method is deprecated. * @expectedDeprecation The second argument of the "%s" method is deprecated. You used the Symfony Stopwatch Component to calculate the duration time of your process, here 10 seconds. However, depending on the load of the server or the processes running on your local machine, the $duration could for example be 10.000023s instead of 10s . This kind of tests are called transient tests: they are failing randomly depending on spurious and external circumstances. They are often cause trouble when using public continuous integration services like Travis CI. The ClockMock class provided by this bridge allows you to mock the PHP's built-in time functions time(), microtime(), sleep() and usleep(). If you don't want to use the @group time-sensitive annotation, you can register the ClockMock class manually by calling ClockMock::register(__CLASS__) and ClockMock::withClockMock(true) before the test and ClockMock::withClockMock(false) after the test. An added bonus of using the ClockMock class is that time passes instantly. Using PHP's sleep(10) will make your test wait for 10 actual seconds (more or less). In contrast, the ClockMock class advances the internal clock the given number of seconds without actually waiting that time, so your test will execute 10 seconds faster. New in version 3.1: The mocks for DNS related functions were introduced in the 3.1 version of this component. The @group time-sensitive and @group dns-sensitive annotations work "by convention" and assume that the namespace of the tested class can be obtained just by removing the Tests\ part from the test namespace. I.e. that if the your test case fully-qualified class name (FQCN) is App\Tests\Watch\DummyWatchTest, it assumes the tested class namespace is App\Watch. New in version 3.2: This modified PHPUnit script was introduced in the 3.2 version of this component. The script writes the modified PHPUnit it builds in a directory that can be configured by the SYMFONY_PHPUNIT_DIR env var, or in the same directory as the simple-phpunit if it is not provided. Set the SYMFONY_PHPUNIT_VERSION env var to e.g. 5.5 to change the base version of PHPUnit to 5.5 instead of the default 5.3. 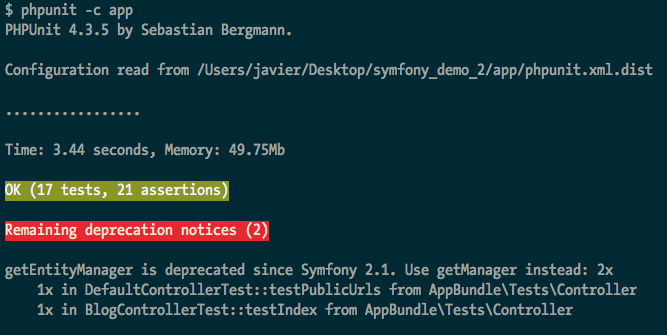 If you still need to use prophecy (but not symfony/yaml), then set the SYMFONY_PHPUNIT_REMOVE env var to symfony/yaml.